The Ford F-450 comes in a crew cab body style with dual rear wheels and an 8-foot bed for greater stability and weight handling. It has standard four wheel drive and five trim levels; Lariat, XLT, XL, Platinum and King Ranch. The XL is mainly intended as a bare bones work truck. The XLT provides more powered accessories and creature comfort. On the other hand, the luxurious Lariat is fully equipped with duo zone automatic climate control and leather. The King Ranch offers glamour with its 20 inch alloy rims, two tone paint, leather seats and trim. Buying a used Ford F-450 gives you 5,880 pounds of payload capacity and a towing capacity of 24,700 pounds. 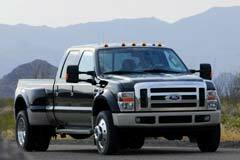 The F-450 is powered by a 6.7 L turbo diesel V8 engine that generates 400 horsepower and 800 lb-ft of torque. It comes with standard antilock disc brakes, a massive center armrest and dual door pockets.